By Jean Evans — early years consultant and author. Get into the spirit of Christmas by creating simple decorations using an exciting array of colourful and shiny recyclable materials. Choose a suitable area where the children can design and make Christmas decorations. Provide creative resources with an emphasis on festive colours such as red, green, gold and silver, as well as shiny, reflective materials. Make an interactive display with appropriate posters, photographs and pictures on the wall and a table containing a selection of Christmas tree decorations to explore underneath (avoid decorations that are made of glass or with sharp points). Stand an artificial Christmas tree near the area. Encourage the children to explore the resources and create their own decorations to hang on the tree. 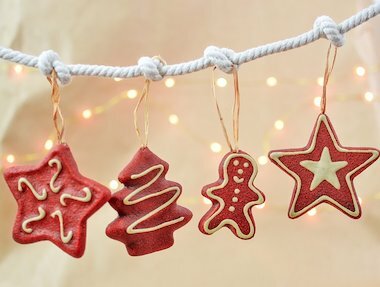 Vary the selection of resources when focusing on a specific type of decoration, for example, making tree garlands with paper strips or imitation sweets with screwed-up paper covered in Cellophane. Posters, photographs and pictures of decorated Christmas trees and festive scenes of children opening parcels and stockings; Christmas tree decorations such as baubles, tinsel, salt-dough hangings and an angel; Christmas wrapping paper; tissue paper, Cellophane and crêpe paper; shiny items such as sequins and glitter; gold and silver foil; short lengths of tinsel; silver and gold thread; pine cones.